Adidas Adizero Boston 7 are neutral performance running shoes. It is difficult to justify current Adidas Adizero Boston 7 because sixth edition is doing great from both sales figures and user satisfaction points of view. It is a similar situation happening with its smaller sibling the popular racing flat Adizero Adios Boost 3 and there is no much room to improve final product following same principals. 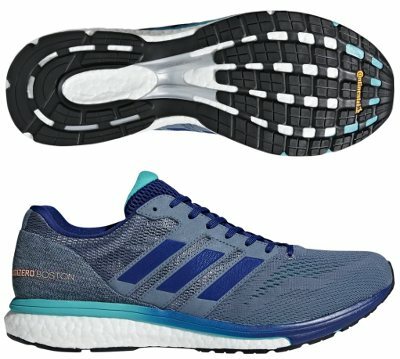 So the excuse from the german brand to have a new member within the Adizero Boston family in 2018 has been to release a limited "Boston Marathon®" edition. Limited changes compared with its predecessor Adizero Boston 6 and most of them take place in upper where MicroFit mesh allows more ventilation to improve breathability and takes advantage of World famous three stripes from Adidas to embrace midfoot for snug and secure fit. Another minor but appreciated upgrade is the increase of the padding in heel collar area that results not only in improved comfort but also better coupling. Rest of Adizero Boston 7 remains untouched featuring superb StretchWeb™ outsole configuration developed in partnership with renowned tyre manufacturer Continental™ used as well in premium Solar Boost. Although not present any more in commercial name, midsole is basically made of successful Boost™ foam with firmer EVA layer on top for great blend of cushioning and responsiveness. Another classical element in Adidas running shoes is the Torsion® system which provides natural integrity in midfoot for good stability decoupling forefoot from rearfoot.